Medical laboratory technicians (also known as Medical Laboratory Technologist, Clinical Laboratory Technologist, Clinical Laboratory Technician, Biochemistry Technologist, Chief Medical Technologist or MLT) are skilled individuals working under the supervision of a certified medical laboratory technologist. They perform routine tests that include the analysis of bodily fluids (such as blood, urine, and various tissues), studying blood samples for use in transfusions (examining the blood type and number of cells), logging data in the patient’s record, and relaying results and findings to physicians. For more on job duties and how to become a MLT, please visit our medical laboratory technician job description page. Medical laboratory technicians work in several possible environments. The majority tend to work in hospitals or medical and diagnostic laboratories, meaning a well-lit, clean, and clinical environment. Others work in dentists’ or physicians’ offices, offering a similar, though potentially more relaxed atmosphere, depending on how the private practice is appointed. Still others work in federal or state agencies. The work does involve contact with infectious material, however work laws (and training in proper medical practice) require technicians to remain protected with the use of goggles, gloves, and masks for their everyday work. These also aid in protecting one from some of the visual and olfactory displeasures such a position may entail. Most medical laboratory technicians work regular business hours (7-3, 8-4, etc), though this varies depending on the institution worked for. A typical 35-40 hours weekly work schedule is expected. Hospitals or other 24-hour facilities may require shifts during evenings, weekends, or holidays, though this will rarely be on an emergency or overtime basis. The mean annual medical laboratory technician salary is $39,340. The mean salary is calculated by adding all the wages within the occupation and divid that value by the total number of employees. Lowest 10% of this occupation makes less than $24,790 and the top 10% makes over $57,710. The job outlook for medical laboratory technicians is extremely promising; the bureau of labor and statistics is projecting a 30 percent employment growth between 2012 and 2022, much faster than the average for all occupations. This is, in part, due to the aging population, leading to an expected increase in the need for medical tests related to cancer, diabetes, AIDS, and other laboratory procedures. Federal legislation is also increasing the number of patients with access to health insurance, increasing demand for the services of medical laboratory technicians. However, the advancement in technology has also made a negative impact on job growth of MLTs. In fact, new innovations have made previous laboratory-only tests such as pregnancy tests, diabetes tests, or STD tests accessible, allowing people to carry them out in the comfort of their own homes rather than through laboratories. Medical laboratory technician salary averages approximately $39,340 per year nationally, however this average can vary by around $20,000 in either direction. The factors primarily influencing this variance are the industry worked and the geographic location, with experience offering some additional minor influence. Medical laboratory technicians can be trained on the job, or via a two-year degree. With the job market as it currently is, those with a two-year degree are more likely to receive a position in a higher-paying industry, as they will be more qualified with less need of paid training time. Employers often look for individuals with certification and in turn they receive higher wages. There is little room for specialization for medical laboratory technicians; much of the work is done under the supervision of a medical laboratory technologist, who will perform the more complex tests and specialized work. Experience is a small factor in medical laboratory technician salary, offering standard improvements with greater time spent on the job. However, it does not hold the financial possibilities of other factors. Generally, new graduates of this occupation starts at $25,000 annually while experienced technicians can make upwards from $45,000. Position is not a factor, as a medical laboratory technician works under the supervision of a laboratory technologist. While they may be part of a team, a technician would need to advance their education to the level and certification of a technologist to see any notable change in position and requisite salary. 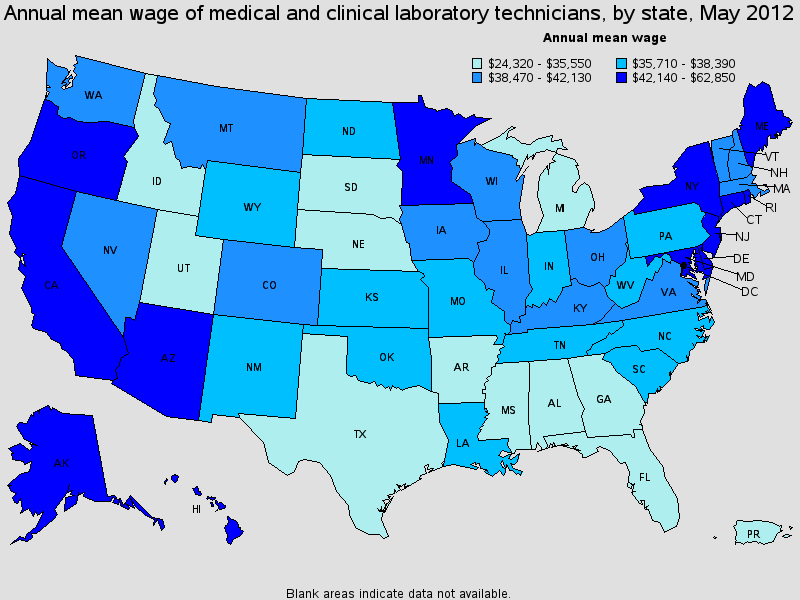 Industry is a factor heavily influencing medical laboratory technician salary; while a technician working in various ambulatory health care services can expect a salary of $36,210, or just below the national average, one working in the medical equipment and supplies manufacturing industry will earn around $50,930. The most lucrative industry, however, is in the offices of dentists, where the annual mean salary is $57,380. Location is the primary influence on medical laboratory technician salary, offering a range of potential annual earnings from $18,900 to $62,850. The latter salary is available in the state of Rhode Island, the best paying state for this position. District of Columbia follows, at $52,760, and Alaska has the third-best wage at $51,470. Rhode Island also has the highest-paying metropolitan area, with Providence-Fall River-Warwick offering salaries averaging $58,860. Bridgeport-Stamford-Norwalk, Connecticut holds the second position here at $57,490, and San Francisco-San Mateo-Redwood City, California comes in a close third at $57,420.